In a somewhat unusual move, Sony has added two flagship TVs to the line-up late in the year with the ‘Master’ series TVs. The Master series includes Z9F (ZF9), which is an LCD flagship model, and A9F (AF9), which is an OLED flagship model. Both are being promoted as being true to the “creator’s intent" in terms of picture representation, and for the first time Sony support CalMAN’s auto-calibration software. The A9F OLED supersedes last year’s A1 model, offering features such as a more powerful Acoustic Surface speaker system, an easel stand, a more powerful video processor (X1 Ultimate), and not least Android Oreo (version 8), which is also powered by a new processor.Sony A9F in the US and AF9 in Europe is available in 55 and 65-inch sizes. There is no 77-inch version available. From a design perspective A9F resembles the now-discontinued A1 as it is based on the same concept with an easel stand being an integrated part of the TV. The solution includes a foldable easel stand and a module that houses electronic components and subwoofer. As an extra plus Sony A9F is the first TV on the market to support HDMI eARC, which makes it capable of handling lossless audio formats. For example, it will be possible to pass Dolby Atmos in Dolby TrueHD or DTS:X to a soundbar connected to the TV via HDMI – also pass-through if sound is coming via a HDMI source connected to the TV. One of the features that eARC brings to the table is mandatory lip-sync synchronization, which is a common complaint when connecting TVs to soundbars. eARC is a new foundation and it effectively means that you can bypass the receiver and ensure that picture and audio is always perfectly synchronized. Sony recently updated its range of Atmos / DTS:X capable soundbars with eARC so it is setting the stage for improved TV audio. eARC is part of the HDMI 2.1 standard but can be implemented in some HDMI 2.0b TVs. Sony has yet to adopt other elements of the HDMI 2.1 standard such as variable frame rate, auto low latency or quick media switching (QMS). Peak brightness is actually a tad lower than A8F. A9F hits around 720 nits, whereas A8F hit 750 nits. Compared to LG and Philips, there is some ground to cover before Sony can hit the 800-900 nits that these TVs are capable of. The built-in ABL (Automatic Brightness Limiter) function is not as unrestrained either as on Panasonic FZ800 so brightness drops faster as a function of APL (Average Picture Level = % coverage of the full screen).The difference between 700 and 900 nits is visible to most eyes so OLED TVs from LG, Philips and Panasonic can hit higher values – otherwise LCD TVs such as Samsung’s Q series or Sony’s own ZF/XF TVs are substitutes. There has been a lot of discussion in regards to a firmware update that Sony pushed out to its A1 OLED model. The update included a new automatic dimming function that sometimes erroneously kicks in when there are static elements in the picture. After the update, owners of the A8F model started reporting similar issues. The mechanism is a safeguard to reduce the risk of burn-in but unfortunately it also kicks in when playing console games showing static elements such as a map or when watching sports with a static scoreboard at the top of the screen. 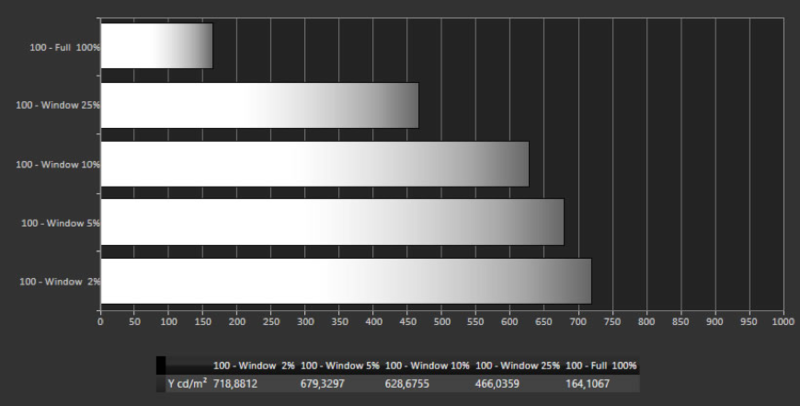 In the graph below uses an HDR test pattern to replicate the effect. The TV starts lowering its overall brightness and the process takes about one and a half minutes before it settles on a lower brightness level. When switching pattern (in this test from a 2% to 5% window), brightness peaks temporarily after which it quickly starts to dim. ​Once the TV starts running this dimming cycle there is not really any stationary start level on which it can maintain its highest brightness level and only after “cleaning” the screen with a more varied video scene can you once again achieve normal brightness for about 30 seconds. The affect the viewing experience is illustrated below with photos from the game Spider-man, where the left side is the starting point with normal brightness levels and the right side representing the state after the TV has been inactive for a couple of minutes. It is not possible to see the gradual dimming with the naked eye when sitting in front of the TV and the end result is not particularly obvious unless one know what to look for (i.e. highlights). For mixed use, problems were no encountered but with it was visible with HDR static elements, not with SDR content. Sony is claiming that its Master series of TVs are as true to the film creator’s intent as possible with today’s technology and the measurements show the TV can indeed hit very accurate levels – after being tweaked. After calibration, A9F delivers improved color accuracy and thanks to Sony’s “smooth gradation” compensation it provides smooth color gradations. A9F is the first Sony TV to actually have Dolby Vision enabled and in this regard the “smooth gradation” feature is not as useful with Dolby Vision content as it has a tendency to make the picture too soft and affect fine details. As a consequence, activating HDR10 and SDR content is probably best. A9F can reproduce all of the steps on the grey tone scale and does not crush either highlights nor shadow details. Support for Dolby Vision allows the TV to process content in the dynamic metadata format, which is an advantage an Apple TV 4K, capable UHD Blu-ray player or the built-in Netflix app is used. The quality of upscaling of low-resolution sources is great so even conventional TV broadcasts will look decent on A9F. Sony’s video processor has historically excelled in this area and the upgraded version continues to offer excellent performance across the board. OLED panels tend to suffer somewhat when it comes to reproducing low frame rate content, caused by the panel’s extremely fast response time. The result is that motion shot at low frame rate (i.e. movies at 24p) tend to have a sort of stroboscope effect that is perceived as motion stutter. The optimal solution would be to start shooting content at higher frame rate but that is unlikely to happen anytime soon. Activating the TV’s motion system that inserts artificial frames into the video stream for smoother video can minimize the effect. The downside is that this technique often leads to the so-called “soap opera effect” (SOE) but Sony offers user settings and the MotionFlow system can effectively improve motion without introducing visible artifacts around moving objects and SOE. The OLED panel homogeneity is not perfect and there was some mild banding below 5 IRE as well as a weird bright section near the left border. Homogeneity varies from one sample to another so our sample may not be representative for what buyers will get. It can go both ways. On the other hand no issues were encountered with color tinting. One area that has seen improvement as a result of the upgraded X1 Ultimate processor is gaming specifically input lag. Sony has managed to reduce input lag especially for 1080p HD gaming, which is good news for owners of the “old” game consoles. 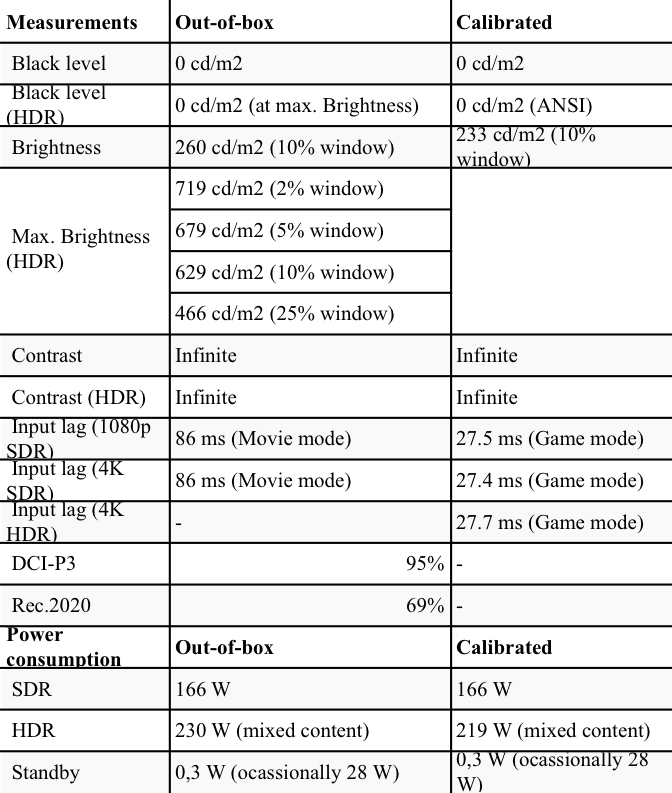 In Game mode input lag was less than 28 ms for both 1080p and 4K, with and without HDR. For the other picture modes, A9F ticks in at over 80 ms, which is too high for gaming. The Game mode can relatively easily be calibrated to deliver accurate colors (which is not always the case) so we recommend that you use the Game mode for console gaming. Sony A9F now has four full-bandwidth HDMI ports, meaning that you can connect 4K HDR 60Hz sources to all four of them at the same time. The viewing angles are as wide as you would expect from an OLED TV – and almost perfect. The TV has an updated version of the Acoustic Surface (now with a ‘+’) audio system comprising new actuators and the option to use the TV as a center speaker in a surround sound setup. It has also gained support for HDMI eARC that allows it to handle lossless audio, including Dolby Atmos and DTS:X.A9F has an upgraded ’X1 Ultimate’ video processor that delivers the same high standard of performance expected from Sony. Furthermore, the TV has an upgraded MediaTek chip and Android Oreo that together deliver a far smoother user experience, now with a revamped home screen (as part of Oreo) that pulls content from within your favorite apps directly onto home screen (however, only a handful of apps support this integration). The design will likely divide opinion as it is not the slimmest out there but it is worth pointing out that A9F has high-quality materials – with the exception of the remote control. A9F in the US and AF9 in Europe has a list price that is 20-35% higher than A8F / AF8 and it offers some meaningful advantages mostly in the area of features and user experience. Support for auto-calibration is good news and an advantage over A8F but from a picture quality point of view the improvements are so small that we refrain from passing on our Reference Award – we are not operating with .5 increments.